I was kind of a weird fit: although I had taught high school in the Richmond, CA area--north of Berkeley--for a couple of years in the early 1990s, I was now on an Associate Professor of Sociology at Purdue University North Central in Westville, Indiana, which is a very different world than public schools in Chicago (in more than one way). 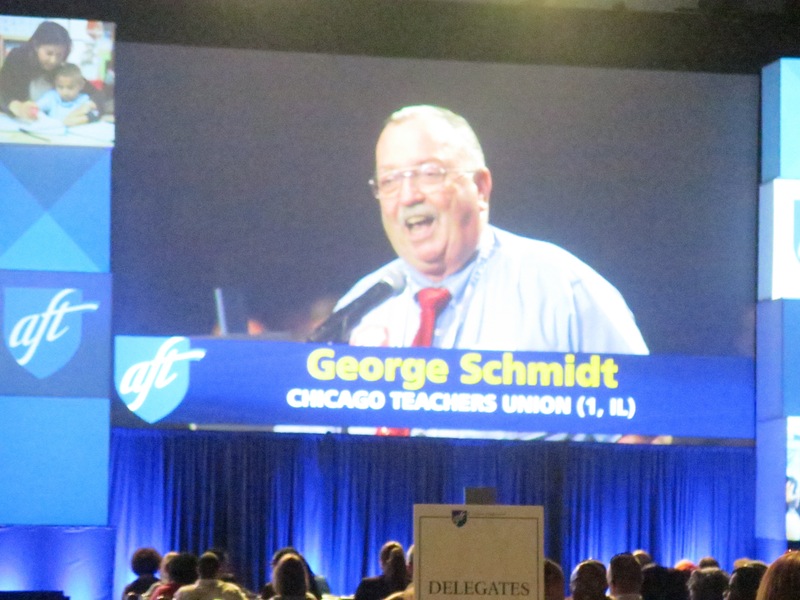 George Schmidt takes the floor at the AFT convention in Los Angeles, July 2014.I never taught school in Chicago, and was never a member of the Chicago Teachers Union (although I was the Chair of the Chicago Chapter of the National Writers Union from 2011-15). Yet I had been an inner-city classroom teacher, and my different viewpoint sometimes provided a useful alternative for folks of Substance. The things I remember most about George were his encyclopedic memory, his sense of institutional history (both of the CTU and CPS), his years of experience both in and out of the classroom, and his dedication to getting pictures and getting our stories “right.” He had an extensive photographic collection, and he was always pulling out amazing photos to help illuminate our stories, in addition to those we took on site. He held us to high standards and even when we didn’t always reach them, he kept pushing us to do so. And that’s the “journalistic” side to him. There’s one thing I’ll share that’s always stuck with me. Susan Zupan, a teacher at Taylor School on the southeast side of the city, was a delegate and a staunch union member, and was an active Substance writer/editorial board member. Not surprisingly, her administration wasn’t too fond of her. She would be battling to make sure her students got everything she and her colleagues could give them. She was fighting her school administrators, the network mucky-mucks, and she didn’t always get the support from the Union that she deserved. A number of times, she come to our monthly meetings with her head down; the bastards had been beating up on her. She’d share with us what was going on, and George would know just what she should do: file this grievance, organize your members, write more for Substance! Three hours with George, with the rest of us in supporting roles, and she’d be ready to go again! He had a special place in his heart for those still in the classroom, and he gave so much to Susan--and she’s still there, fighting for what’s right. Even more important, in my opinion, was that he was an activist and his activism was much broader than just around education. He had that drive and passion until the end of his life. The son of two US military veterans, and me a former Marine--I turned around on active duty, while George figured things out before going into the military and resisted--we shared an interest in military history, but we talked about his anti-war work among US military personnel during the Vietnam War. Two American working class men whose lives were profoundly affected by that damn war, we shared many a story, as I’d often come before and stay after meetings just to “hang out” with George. I taught at Ton Duc Thang University in Ho Chi Minh City (formerly, Saigon) during the last two summers (2017 and ’18). He was curious about what had happened in the country after the war, and I shared with him what I have learned. I got back from Vietnam this year on August 17, after visiting my daughter in The Netherlands, and wanted to share a special thing with George. It was too important to share via e-mail, plus I wanted to see how he was doing; I’d seen the small number of articles published this summer, so I was concerned he was having a hard time. I called him, and he picked up--and we had a great 20 minutes together. He had great respect for the Vietnamese liberation fighters, and I had just visited the tunnels of Cu Chi (about 70 km northwest of Ho Chi Minh City); these tunnels protected the fighters from the bombs from the B-52s, and served as an infrastructure for fighting in the area. I told him about what I had learned: that the Vietnamese had dug over 250 kilometers of tunnels, all by hand, to fight foreign invaders (the Japanese, the French, the Americans); that some of the tunnels had three levels, so they not only had their Southern headquarters there, but they had hospitals and meeting/sleeping/cooking rooms in the complex; that they used them to fight the American and South Vietnamese forces--they weren’t for “hiding.” He had read about them, but I must say he was envious when I told him I had actually gone underground in a couple of the tunnels; a truly amazing experience, one which he “got.” I was glad to share those stories with George. And now he’s gone. He wasn’t a saint, and he caused problems because he demanded that mere mortals live to his high standards--but I never saw him ask more of anyone than he himself could provide. I know he pissed off union leaders, and there’s a bunch of “former friends” out there, but I hope that Union members will ensure that there be a reference room/research library or something else appropriate in the Union building that keeps the memory of George Schmidt alive in the hearts and heads of classroom teachers. His spirit will always be with people around the world, fighting for social and economic justice: George Schmidt, Presente! Kim Scipes, PhD, is a recently-promoted Professor of Sociology at the newly-renamed Purdue University Northwest in Westville, IN. A global labor activist and scholar, he has published widely in the US and around the world. Should folks be interested, his publications--many on-line--can be accessed at https://faculty.pnw.edu/kim-scipes/publications/#2 .